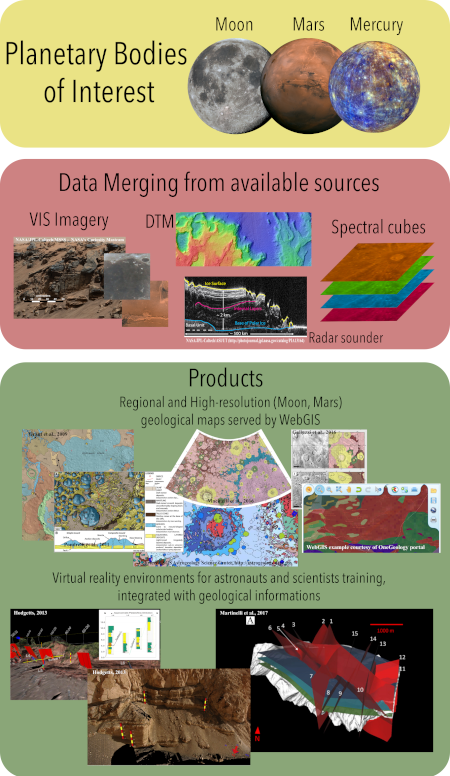 The innovative approach of PLANMAP is to integrate data from different sources (images, DTMs, spectral-cubes, chemical data, radar sounding products, in situ observation) to produce geological maps specifically dedicated to planetary exploration at different levels (orbital probes, robotics and human). The final result would be planetary geological maps that, unlike the traditional photo-interpreted ones, should be more similar in information to Earth geological maps where the geomorphological, structural, and stratigraphic characteristics are integrated with other information (lithological, compositional, and ages on Earth; colors, spectra, elemental composition, and absolute model ages on other bodies). To handle the fusion of such a wide range of data, multidisciplinary collaboration among geologists, geophysicists and astrophysicists is needed and guaranteed by the PLANMAP consortium. Indeed, we have gathered leading European experts on planetary science covering the broad field of knowledge required for geological map generation in the different planetary contexts of Mars, the Moon, and Mercury. Rather than being substitutes for standard maps, our products will integrate them at different scales for diverse scopes: 1:3.000.000-1:500.000 integrated with 3D geological reconstructions vs 1:5.000.000-1:2.000.000 of the traditional quadrangle maps for orbital observation strategies, 1:100.000 integrated with 3D geological reconstructions for robotic missions, 1:10.000 integrated with virtual representations and 3D geological reconstructions for astronaut training applications. Despite the different scales (quadrangle and sub-quadrangles at 1:3.000.000-1:1.500.000 on Mercury, regional at 1:1.000.000 to 1:100.000 on the Moon and from broad 1:12.000.000 to very local scales 1:10.000 on Mars) and resolutions (160 m/pixel on average for Mercury and up to 0.5m/pixel for the Moon and Mars) the geological mapping approach requires the same highly synergic expertise for any kind of planetary surface. Hence, rather than subdividing the Working Packages (WPs) on the bases of the different planetary bodies, we have opted for WPs focused on the specific activities necessary for defining the geological mapping work-flow. WP8) Dissemination, exploitation and communication (led by UNIPD). Each WP is led by an expert in a specific activity but involves many other members of the consortium. 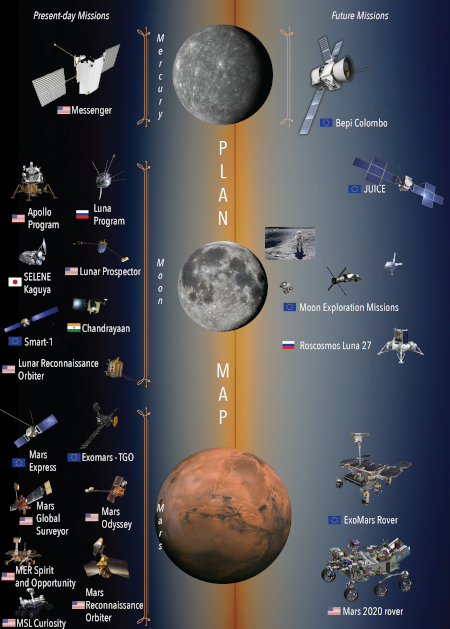 Using data coming from several missions to the Moon, Mars, and Mercury, PLANMAP will generate data and tools that will be extremely useful for future missions. In particular, they will help in preparing observation strategies for orbiting probes, select locations of high interest for exploration or exploitation reasons, select landing sites in scientifically interesting and safe places and characterize them, focus the strategy of exploration with rovers. In addition, the same products will be very effective in training astronauts for future manned mission to the Moon and Mars and in preparing the next generation of planetary scientists. PLANMAP aims to improve the quality, quantity, and efficiency of modern planetary geologic maps by establishing procedures and creating novel products, which will have immediate impact on observation strategies of scheduled ESA space missions and on planning future ones. This will ensure European society can play a leadership role in exploring/exploiting planetary bodies, both scientifically and economically. In this context, the geologic maps, the 3D geo-models, and the augmented virtual environments of PLANMAP will be used to train the next generation of planetary scientists and astronauts through companion Europlanet and ESA activities (e.g., ESA-PANGAEA training course or VESPA workshops).